In January 1891, a young photographer from Deadwood, South Dakota, documented the Pine Ridge Campaign through a series of pictures. 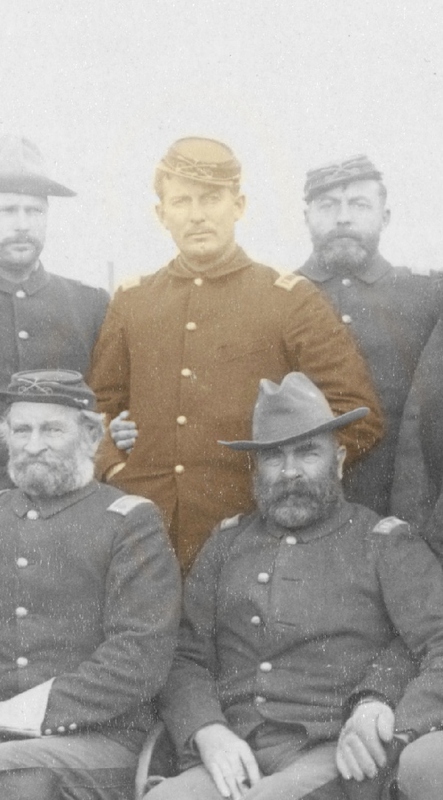 His name was John C. H. Grabill, and among his photographs was one that he aptly titled “The Fighting 7th Officers.” I have adopted his photograph as the banner for this blog, as it is an extraordinary grouping of most of the officers that fought together two weeks earlier. 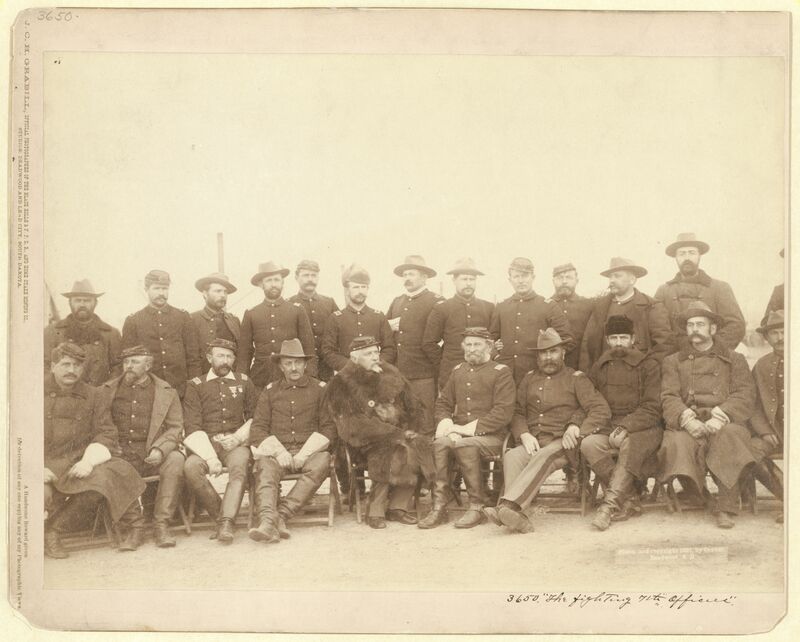 Not all of the officers in the picture were at Wounded Knee, and likewise, some of the officers that were at the battle are not in the photograph. Obviously not photographed were Captain Wallace who was killed in the battle, and Lieutenant Mann who was mortally wounded the following day. In all, there were thirty-three officers present on the field at Wounded Knee, twenty-four were from the 7th Cavalry, three were from the Medical Corps, two were from the 9th Cavalry, and there was one officer each from the 1st Artillery, the 2nd Artillery, and the 2nd Infantry Regiments. One of my primary objectives for this blog is to document the lives of the officers who led their men in battle at Wounded Knee. Grabill’s photograph of twenty-three officers at the Pine Ridge Agency just days after the battles along the Dakota creeks of Wounded Knee and White Clay is an outstanding starting point at identifying these men. Much credit needs to go to Native American historian Walter Mason Camp who identified the twenty-three men on the back of a larger version of this photo that included the two individuals on the far right who are cut off on the banner above. 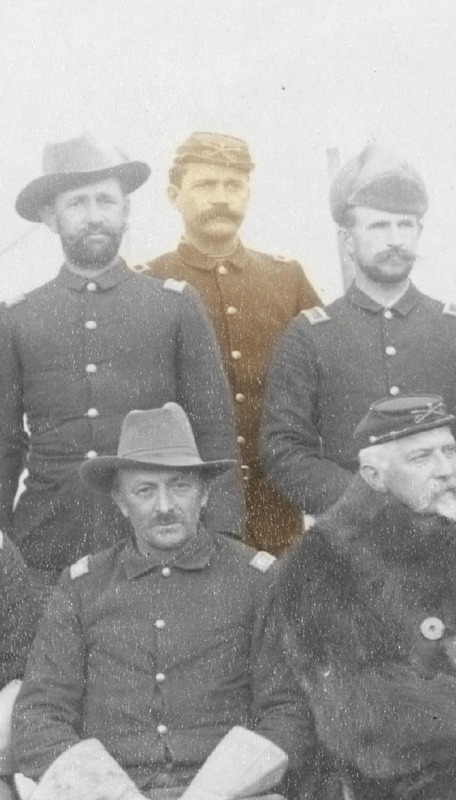 Seated at the far left side of the photograph is Captain Winfield Scott Edgerly. The forty-four-year-old commander of G Troop, 7th Cavalry, was present at Wounded Knee and White Clay Creek. He had served in the regiment since graduating from West Point in 1870, and fought in Captain Weir’s D Company at the Battle of Little Big Horn in June 1876. He retired from the Army as a Brigadier General in 1909 and died in 1927. Moving to the right, the next officer is Captain Charles Stillman Ilsley. At the age of fifty-three, he was the senior captain in the 7th Cavalry and was commanding the regiment’s Second Battalion at Wounded Knee. He had been with the regiment since 1870 but was not at the Battle of Little Big Horn, as he was on detached service in June 1876. He retired at the rank of Lieutenant Colonel in 1899 a week before his death. 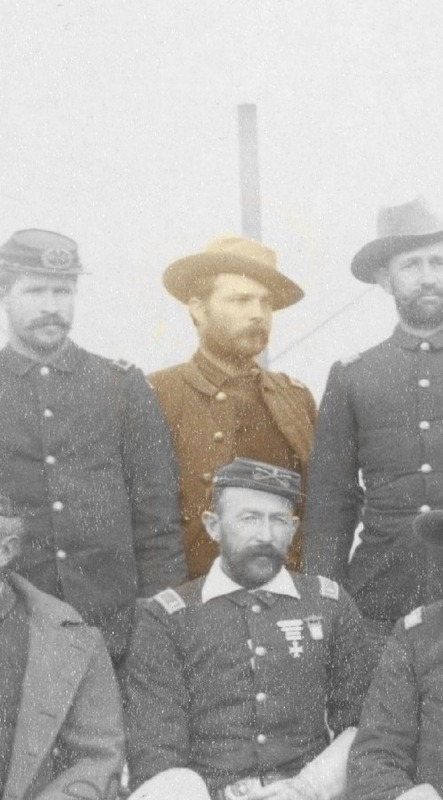 Newly promoted Captain Henry Haviland Wright, was not present at Wounded Knee. 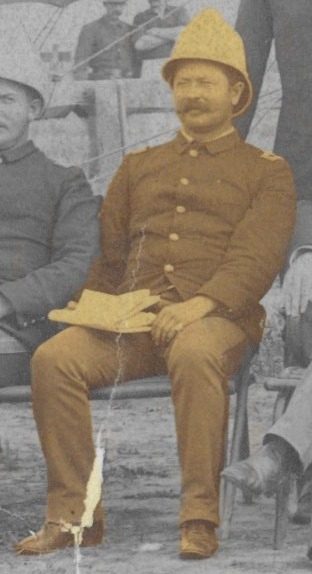 He was assigned to K Troop, 9th Cavalry, and based on his position in the photograph, may have been seated to represent Captain George D. Wallace who was killed at Wounded Knee. During the campaign he commanded his troop under Major Guy V. Henry and likely arrived with the 9th Cavalry at the end of the Drexel Mission fight on White Clay Creek. 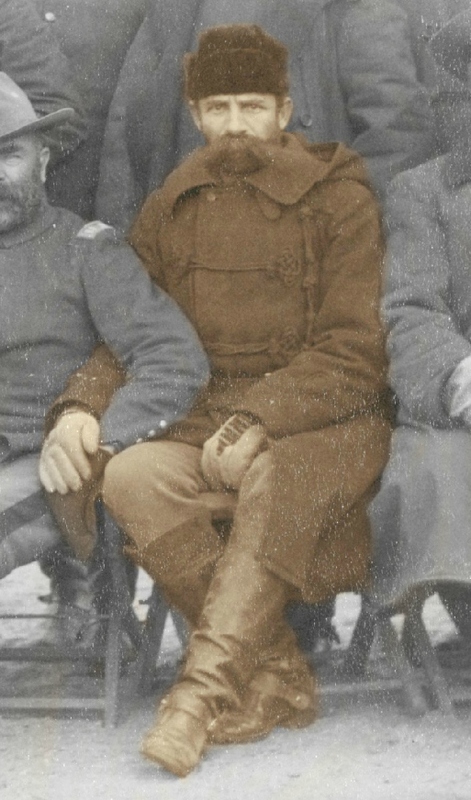 His promotion in the field was so recent that he was still wearing his lieutenant straps in the photograph. Next is Captain Charles Albert Varnum. 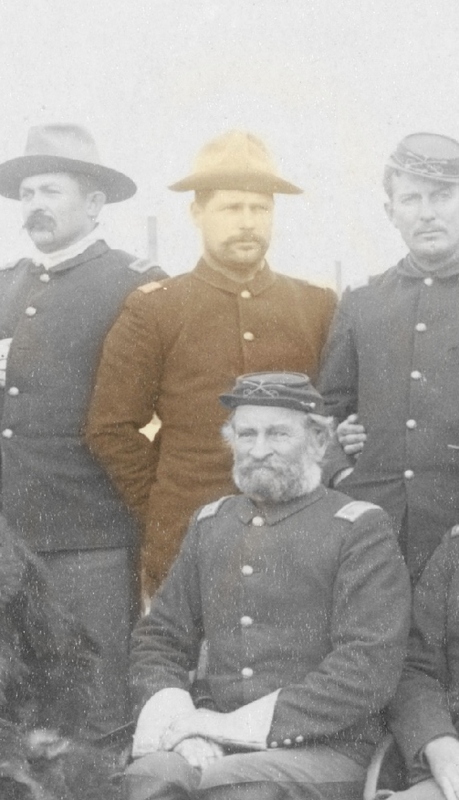 At forty-one, he was one of the youngest captains in the 7th Cavalry. He was present at both battles commanding his B Troop, and was awarded the Medal of Honor for “extraordinary heroism” at White Clay Creek. Varnum was just steps away from his long time friend and West Point roommate, George Wallace, when he was killed at Wounded Knee. They had both been with the regiment since graduating from the Academy in 1872, and both were survivors of the Battle of Little Big Horn. Varnum retired in 1907 as a Colonel and died in 1936. Colonel James William Forsyth was the fifty-six-year-old commander of the 7th Cavalry Regiment and served in that capacity at both engagements. He held a brevet of Brigadier General from his service in the Civil War, and as such was addressed as General Forsyth. 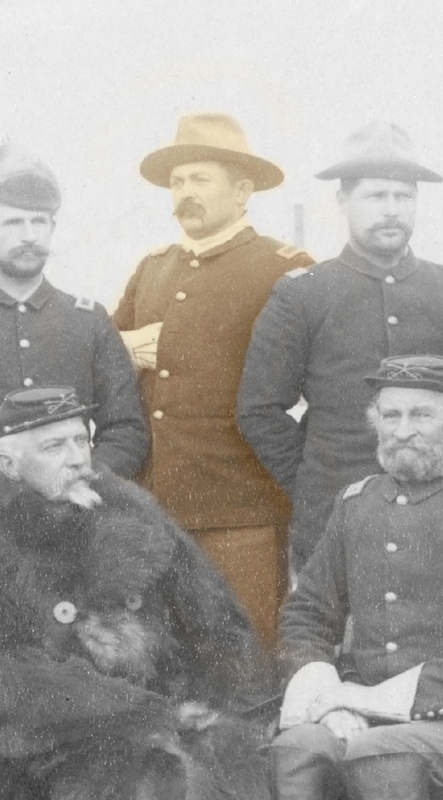 Ironically, he was not commanding the regiment when Grabill took this photo, having been relieved by General Miles pending the outcome of an investigation into his conduct at Wounded Knee. Forsyth retired from the Army as a Major General in 1897 and died in 1906. Major Samuel Marmaduke Whitside was a week shy of fifty-two at Wounded Knee and White Clay where he commanded the 7th Cavalry Regiment’s First Battalion. 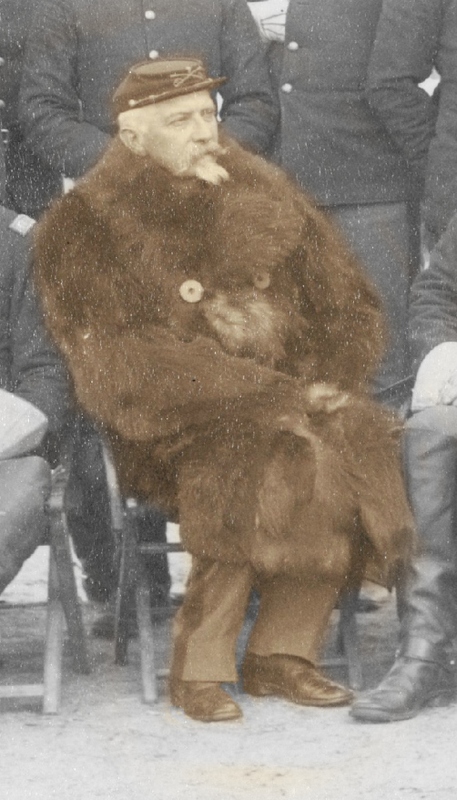 He was recommended for brevet promotions for the capture of Big Foot’s band and for his actions at Wounded Knee. General Miles ensured that neither Forsyth nor Whitside received commendations for Wounded Knee. 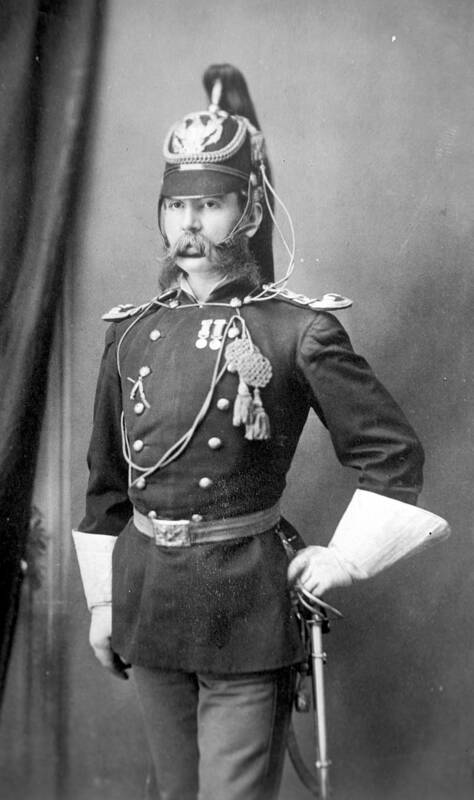 Whitside had been with the regiment since his promotion to Major in 1885. At the time of this photograph Whitside was commanding the regiment during Forsyth’s relief. He retired in 1902 as a Brigadier General and died in 1904. 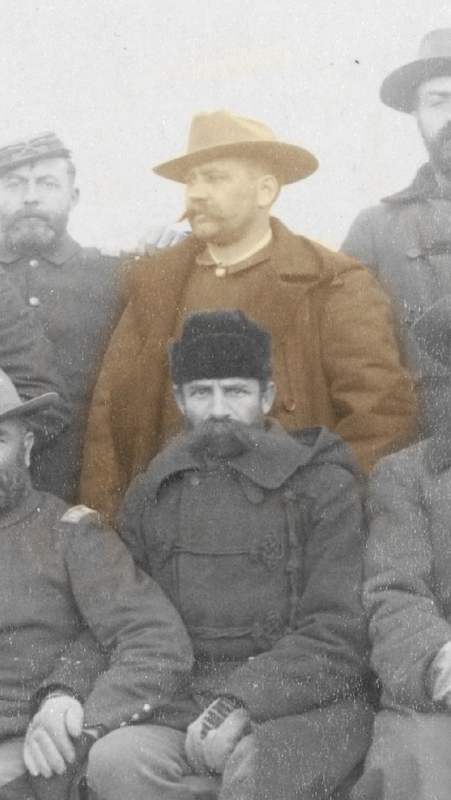 At fifty-two Captain Myles Moylan had been the commander of A Troop, 7th Cavalry, for sixteen years and was present in that capacity at Wounded Knee and White Clay. He had been with the regiment since 1866, and was commanding A Troop on Reno Hill at the Battle of Little Big Horn in June 1876. In 1893, he retired as a Major in the 10th Cavalry and settled in San Diego, California. Moylan died of stomach cancer in 1909. Captain Edward Settle Godfrey, was the forty-seven-year-old commander of D Troop, 7th Cavalry, and was present at both Wounded Knee and White Clay. Two of the most controversial aspects of Wounded Knee occurred under his command, Cavalry fire discipline and the tragedy at White Horse Creek. He had been with the 7th since graduating from West Point in 1867. At the Battle of Little Big Horn he commanded K Company in Captain Benteen’s battalion. He retired as a Brigadier General in 1907 and died in 1932. Captain John Van Rennselaer Hoff was a forty-two-year-old assistant surgeon and ranking medical officer at Wounded Knee. At the Wounded Knee investigation he testified that he did not believe any soldiers were killed or wounded by friendly fire. In 1891, he was commended by the Commanding General of the Army in General Order 100 for “extraordinary heroism.” Hoff retired from the Army as a Colonel in 1912 and died in 1920. In 1925 he was posthumously awarded the Distinguished Service Cross for his actions at Wounded Knee. 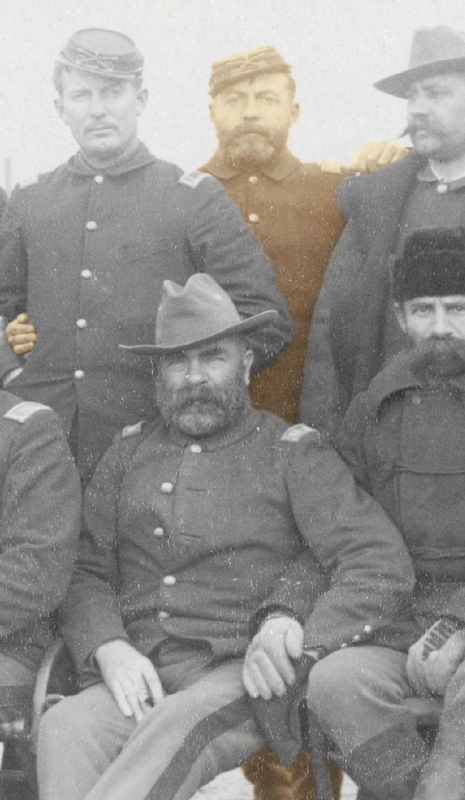 Seated at the far right of the photograph is John Chowning Gresham, the thirty-nine-year-old First Lieutenant assigned to B Troop, 7th Cavalry. Slightly wounded when the bridge of his nose was grazed, he was awarded the Medal of Honor for “extraordinary heroism” at Wounded Knee. He was transferred to the regiment from the 3rd Cavalry following the Battle of Little Big Horn shortly after graduating from West Point in 1876. Gresham retired at the rank of Colonel in 1915 and died in 1926. 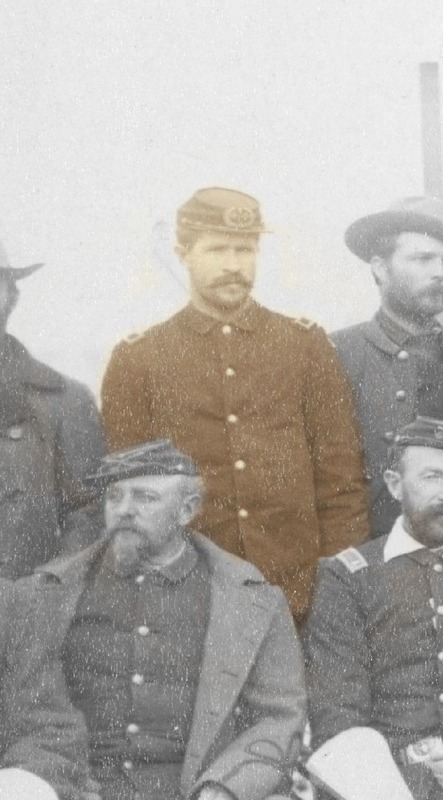 Pictured standing on the far left is thirty-six-year-old First Lieutenant Loyd Stone McCormick, who served as the Regimental Adjutant of 7th Cavalry at Wounded Knee and White Clay. As adjutant he was instrumental in the awards process following the campaign. McCormick wrote an unpublished manuscript of the battle in 1904. He retired as a Colonel in 1914 and died in 1928. 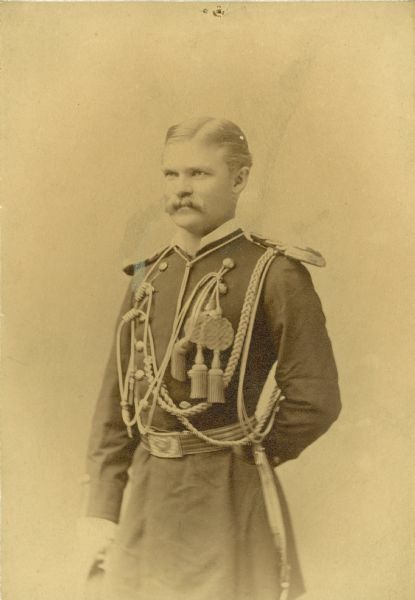 Second Lieutenant Joseph Ellwell Maxfield was the thirty-year-old Signal Corps officer with the Department of the Platte on detached service with the 7th Cavalry while in the field at Wounded Knee. He retired at the rank of Major in 1905, having served as a Lieutenant Colonel in the U.S. Volunteers during the Spanish-American War, and died in 1926. First Lieutenant William Sherley Scott, I Troop, 1st Cavalry, was not present at either battle. 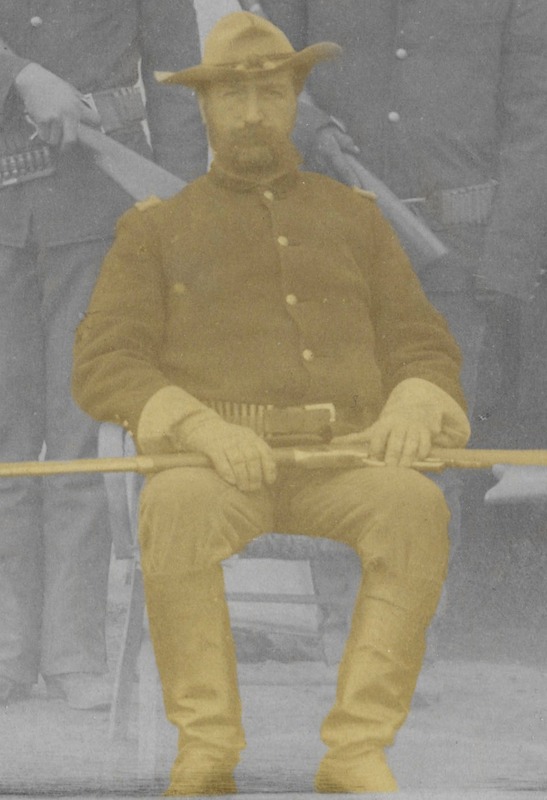 Like Lieutenant Wright, he may have been positioned in the photograph to represent Lieutenant Mann who died of his wounds a few weeks after being wounded at White Clay Creek. Lieutenant William Jones Nicholson, was the thirty-four-year-old First Lieutenant normally assigned to Captain Nowlan’s I Troop, 7th Cavalry. At Wounded Knee he was serving as Whitside’s Acting Adjutant of First Battalion. Nicholson retired as a Colonel in 1920 and was promoted to Brigadier General from the retired list in 1927. He died in 1931. At thirty years of age Lieutenant Sedgwick Rice served as the Second Lieutenant of Captain Ilsley’s E Troop, 7th Cavalry. He was present at Wounded Knee and White Clay, and was awarded a Distinguished Service Medal in 1918 for his actions at White Clay Creek. Rice retired as a Colonel in 1924 and died the following year. Second Lieutenant Thomas Quinton Donaldson, Jr., the twenty-six-year-old platoon leader in Captain Jackson’s C Troop, 7th Cavalry, was one of the youngest officers on the field at Wounded Knee. He retired as a Major General following World War I and died in 1934. Thirty-six-year-old Second Lieutenant James Franklin Bell was assigned to Captain Edgerly’s G Troop, 7th Cavalry, but was still on leave when the battle occurred. He returned to the regiment at Pine Ridge in early January 1891. 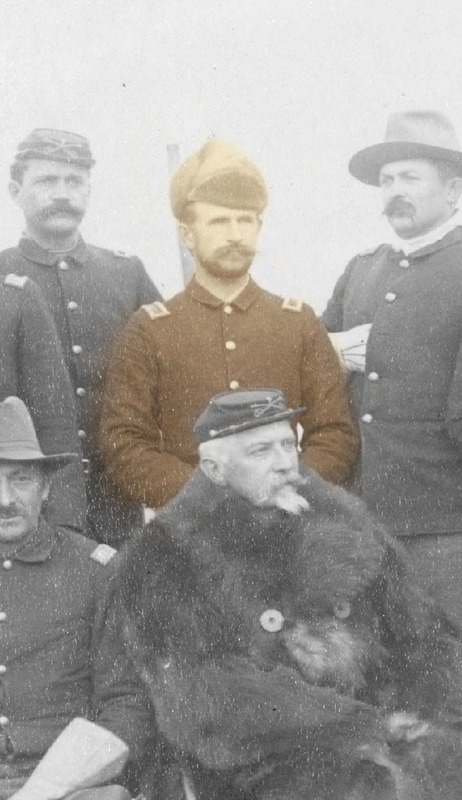 He went on to serve as the fourth Chief of Staff of the Army from 1906 to 1910. General Bell died on active duty in 1919 while serving as a Major General. Lieutenant Herbert Goldsmith Squiers was the thirty-one-year-old Second Lieutenant of Captain Wallace’s K Troop, 7th Cavalry, but was not present at Wounded Knee. He returned to Fort Riley four days earlier to take the examination for promotion to First Lieutenant. He left the Army in 1891 and went on to serve as Minister to Cuba and to Panama and was First Secretary of the American Legation at Peking during the Boxer uprising. He died in 1911. 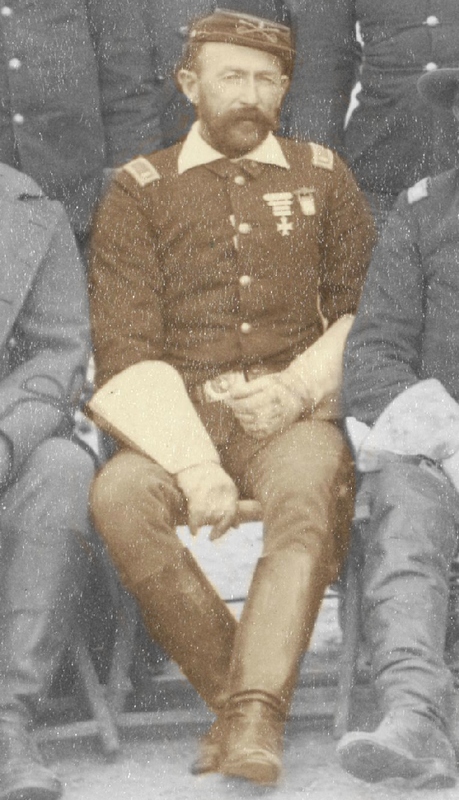 Thirty-six-year-old Lieutenant Edwin Parker Brewer was the First Lieutenant of Captain Edgerly’s G Troop, 7th Cavalry, and was on duty with his unit at Wounded Knee. He retired at the rank of Colonel in 1919 and died in 1932. First Lieutenant Ezra Bond Fuller was the forty-two-year-old Regimental Quartermaster for the 7th Cavalry and was present on the field of battle. He retired as a Colonel in 1904 and died in 1925. 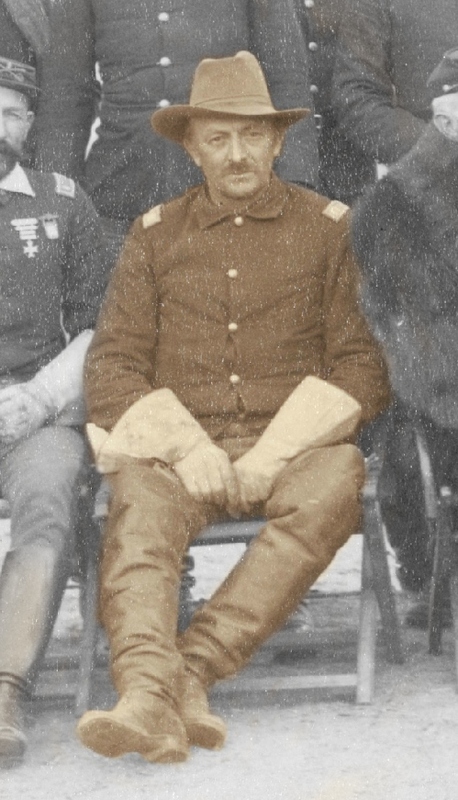 Thirty-six-year-old Lieutenant Horatio Gates Sickel, Jr., was assigned as the First Lieutenant of Captain Ilsley’s E Troop, 7th Cavalry, and commanded that unit at Wounded Knee. He was commended by the Commanding General of the Army in General Order No. 100 in 1891 for “gallant service” at Wounded Knee. Sickel retired from the Army at the rank of Colonel in 1918 and took his own life later that same year. Doctor Daniel LeMay was the thirty-two-year-old Veterinary Surgeon assigned to the 7th Cavalry and was present at Wounded Knee. He served to the rank of Captain and was promoted to Major from the retired list. LeMay died in 1938 in the country of his birth, Quebec, Canada. The last officer standing to the far right of the photograph who is barely visible in the above banner is twenty-six-year-old Lieutenant Selah Reeve Hobbie “Tommy” Tompkins, assigned as the Second Lieutenant of Captain Godfrey’s D Troop, 7th Cavalry. He was present at Wounded Knee and White Clay. He retired from the Army as a Colonel in 1927 and died in 1939. Of the twenty-three officers in Grabill’s photograph, four were not present at Wounded Knee: Lieutenants Wright, Scott, Bell and Squiers. There were fourteen officers who were not pictured in the photograph that were present at Wounded Knee on December 29, 1890. Among the fourteen was Captain Allyn Capron, Sr., the forty-four-year-old commander of Light Battery E, 1st Artillery. He was present at Wounded Knee and positioned on the hill top with his four Hotchkiss steel mountain rifles. He was commended by the Commanding General of the Army in General Order No. 100 in 1891 for “gallant service” at Wounded Knee and White Clay Creek. Capron died in 1898 at the rank of Captain from typhoid fever contracted during the Spanish-American War. Henry Jackson, the fifty-three-year-old Captain of C Troop, 7th Cavalry, commanded his troop at Wounded Knee and White Clay. He had been with the regiment since 1866 and was on detached service during the Battle of Little Big Horn. Jackson retired in 1901 as a Colonel. He was promoted to Brigadier General from the retired list in 1904, and died in 1908. Fifty-three-year-old Captain Henry James Nowlan, served as the commander of I Troop, 7th Cavalry, at Wounded Knee and White Clay Creek. He had been with the regiment from its establishment but was on detached service in June 1876 during the Battle of Little Big Horn. Nowlan was commended by the Commanding General of the Army in General Order No. 100 in 1891 for “gallant service” at Wounded Knee. He died in 1898 while serving as a Major in the 7th Cavalry. Captain George David Wallace at the age of forty-one was the youngest Captain in the regiment. He was killed at Wounded Knee while commanding K Troop, 7th Cavalry. He joined the regiment in 1872 when he and his West Point roommate, Charles Varnum, were commissioned from the academy together. Still best of friends, they were steps away from one another when Wallace was struck down. He had survived the Battle of Little Big Horn in June 1876 largely because George Custer allowed him to join Varnum in Reno’s valley fight. Captain Wallace was posthumously commended by the Commanding General of the Army in General Order No. 36 in 1892 for “conspicuous gallantry” in action at Wounded Knee. 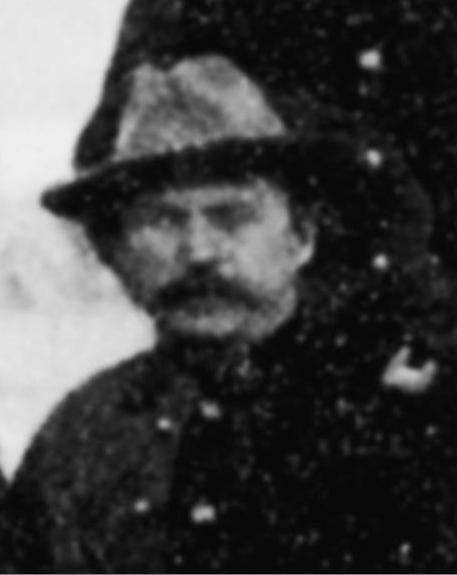 Thirty-six-year-old Lieutenant James DeFrees Mann, was serving as the First Lieutenant of Captain Wallace’s K Troop, 7th Cavalry, at Wounded Knee. He was mortally wounded the following day at White Clay Creek, succumbing to his wounds while recuperating at Fort Riley two weeks later. He was posthumously commended by the Commanding General of the Army in General Order No. 100 in 1891 for “gallantry” in action at White Clay Creek. Lieutenant Ernest Albert Garlington was the thirty-seven-year-old First Lieutenant of Captain Moylan’s A Troop, 7th Cavalry, at Wounded Knee where he was severely wounded. He was awarded the Medal of Honor for “distinguished gallantry” that day. He retired as a Brigadier General in 1917 and died in 1934. Lieutenant William Wallace Robinson, Jr., forty-four years of age at Wounded Knee, was assigned to Captain Godfrey’s D Troop, 7th Cavalry, and was serving as Acting Adjutant of 2nd Battalion that day. He commanded K Troop following the battle at White Clay Creek as a result of the loss of Captain Wallace and Lieutenant Mann. He retired from the Army in 1910 at the rank of Brigadier General and died in 1917. Thirty-four-year-old First Lieutenant Charles William Taylor, 9th Cavalry, commanded A Troop, U.S. Indian Scouts, at Wounded Knee and White Clay Creek. He retired from the Army as a Colonel in 1916 and died in 1939 at the age of eighty-two. First Lieutenant James Denver Glennan was a twenty-eight-year-old Assistant Surgeon assigned to duty with the 7th Cavalry during the Pine Ridge Campaign. He was present at the battles of Wounded Knee and White Clay Creek. He died in 1927 while serving as a Brigadier General supervising the construction of Walter Reed General Hospital. 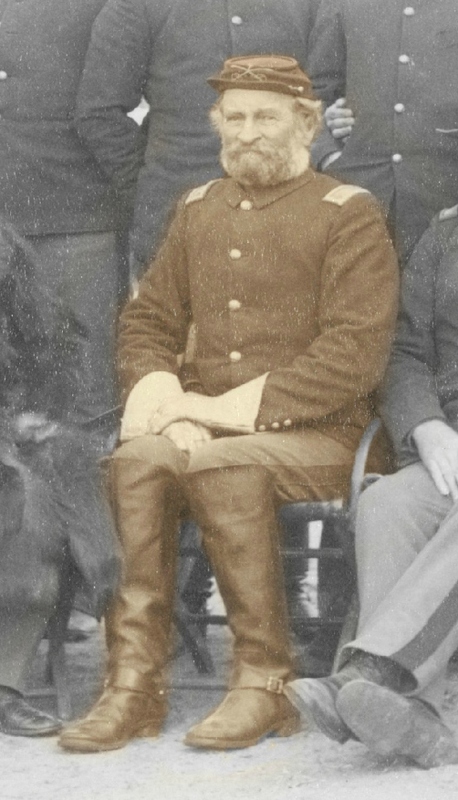 First Lieutenant John Kinzie was the forty-year-old Acting Adjutant of the 2nd Infantry Regiment and was present at Wounded Knee as an observer. He was wounded in the foot during the opening volley. He left the Army in 1897 having attained the rank of Captain. Kinzie served as commandant of Washington State College and died in 1914. At thirty-one Lieutenant Harry Leroy Hawthorne was assigned as the Second Lieutenant of A Battery, 2nd Artillery. 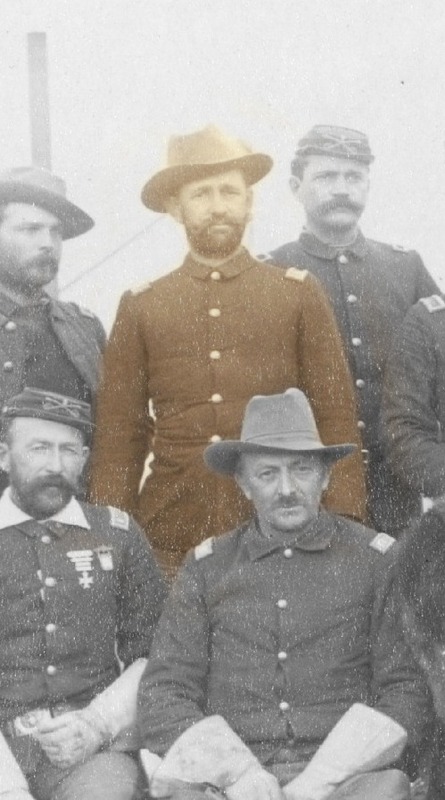 He was attached to Captain Capron’s Light Battery E, 1st Artillery, and was commanding a platoon of two Hotchkiss steel mountain rifles when he was severely wounded at the Battle of Wounded Knee. He was awarded the Medal of Honor for “distinguished conduct” in battle that day. Hawthorne retired from the Army as a Colonel in 1914 and died in 1948 at the age of eighty-eight. 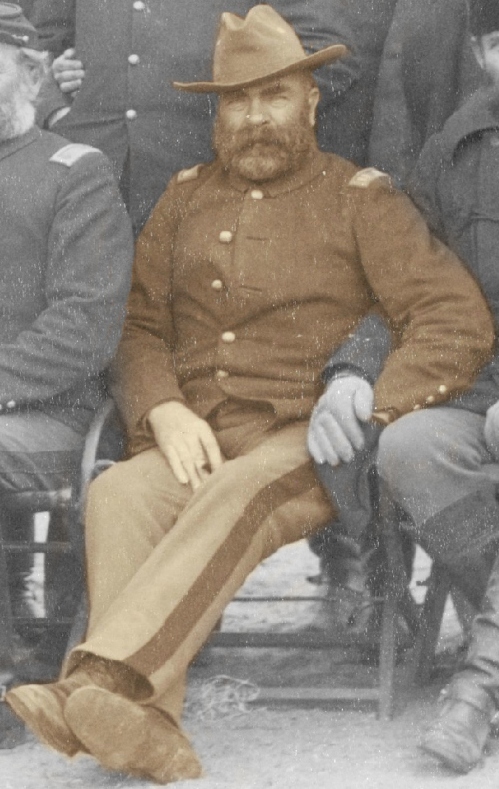 Lieutenant John Charles Waterman was the thirty-three-year-old Second Lieutenant of Captain Nowlan’s I Troop, 7th Cavalry, who had been with the regiment since graduating from West Point in 1881. He fought at both Wounded Knee and White Clay Creek. Waterman retired from the Army as a Colonel and died in 1939. Twenty-six-year-old Lieutenant Guy Henry Preston was the youngest officer at Wounded Knee. He was assigned to the 9th Cavalry and was serving as a platoon leader in A Troop, U.S. Indian Scouts. He was commended by the Commanding General of the Army in General Order No. 100 in 1891 for “courage and endurance” at Wounded Knee. He rose to the the rank of Brigadier General retiring in 1928. When Preston died in 1952 at the age of eighty-eight he was the last surviving officer from the Battle of Wounded Knee. Thirty-two-year-old Captain Charles Beverly Ewing was an Assistant Surgeon in the Department of the Platte and was present at Wounded Knee to observe the disarming of the Sioux Indians. He spent much of that day providing invaluable first aid to the many wounded. Ewing testified at the Wounded Knee investigation that it was “impossible” that soldiers did not wound or kill each other based on their positioning. He attained the rank of Major in the Army and died in 1918. Sixteen of the aforementioned officers at Wounded Knee were graduates of the United States Military Academy at West Point, New York: Colonel James W. Forsyth, class of 1856; Captain Edward S. Godfrey, class of 1867; First Lieutenant William W. Robinson, Jr., class of 1869; Captain Winfield S. Edgerly, class of 1870; Captains Charles A. Varnum and George D. Wallace, class of 1872; First Lieutenant Ezra B. Fuller, class of 1873; First Lieutenants Ernest A. Garlington, John C. Gresham, Loyd S. McCormick, and Horatio G. Sickel, Jr., class of 1876; First Lieutenant James D. Mann, class of 1877; First Lieutenant Charles W. Taylor, class of 1879; Second Lieutenant John C. Waterman, class of 1881; Second Lieutenant Thomas Q. Donaldson, Jr., class of 1887; and Second Lieutenant Guy H. Preston, class of 1888. 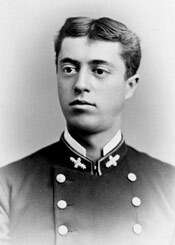 Additionally, one officer was a graduate of the United States Naval Academy at Annapolis, Maryland: Second Lieutenant Harry L. Hawthorne, class of 1882. The Seventh Regiment of Cavalry also had one officer who was a graduate of the Royal Military Academy Sandhurst: Captain Henry J. Nowlan, class of 1854. At least four, possibly five, of the officers were foreign born. Major Whitside was born at Toronto, Ontario, Canada, Captain Nowlan at Corfu on the Ionian Islands of Greece, Captain Henry Jackson at Canterbury, England, and Captain LeMay at Saint-Martin, Quebec, Canada. Early military records indicate that Captain Myles Moylan was born at Galway, Ireland, although later he established that he was from Amesbury, Massachusetts. Several officers in the 7th Cavalry Regiment from Fort Riley were neither in the photograph nor present at the battle of Wounded Knee or the Drexel Mission fight. Major John Mosby Bacon was the senior major in the regiment but was on detached service as the Inspector General of the Department of the Platte at the Pine Ridge Agency; General Brooke denied Bacon’s request to join his regiment during the campaign. First Lieutenant Luther Rector Hare, C Troop, had returned to Fort Riley two weeks prior to the battle at Wounded Knee Creek due to illness. 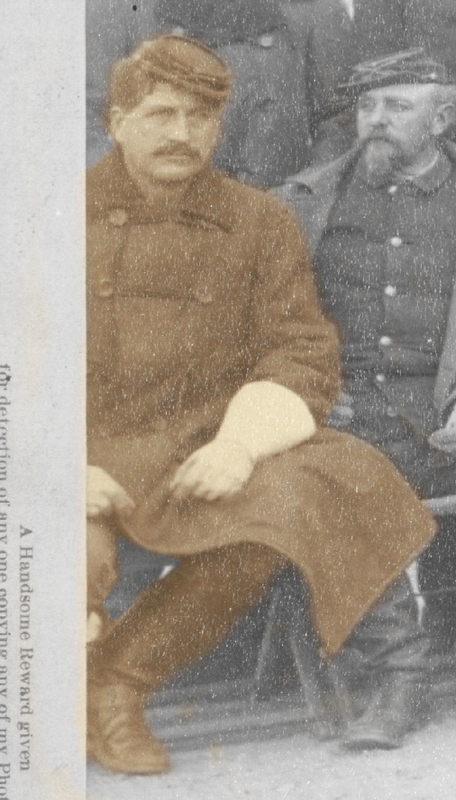 Second Lieutenant John Alexander Harman, A Troop, was on detached service as a professor of military science at the Virginia Polytechnic Institute in Blacksburg, Virginia, and was unable to return to the regiment to join the campaign. Lastly, Second Lieutenant Edwin Corlie Bullock, B Troop, was also returned to Fort Riley at the beginning of the campaign due to illness. 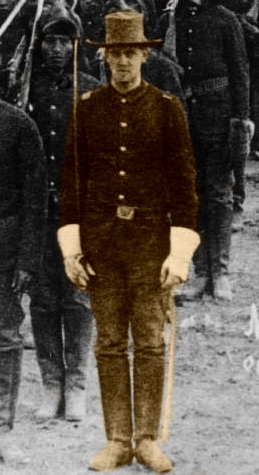 There were another fourteen officers of the 7th Cavalry who were stationed at Fort Sill, Oklahoma Territory and were not deployed during the campaign including Lieutenant Colonel Caleb Henry Carlton who was commanding the post. 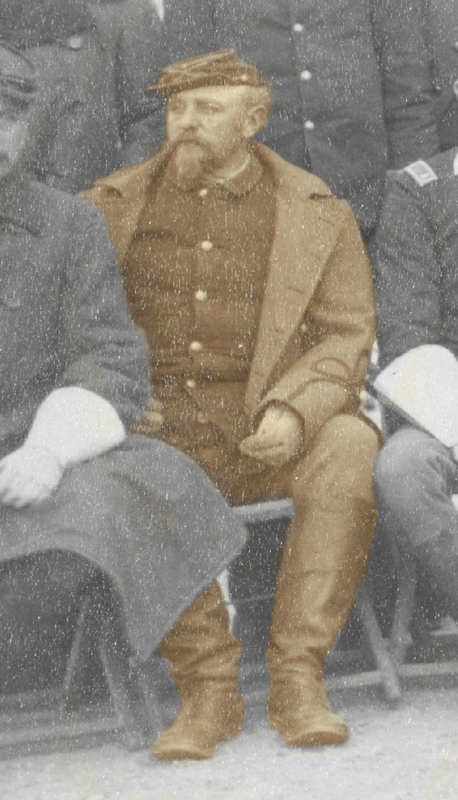 Major Theodore Anderson Baldwin, the junior field grade officer of the regiment, was also stationed at Fort Sill and was on leave during the campaign. The regiment’s F Troop remained at Fort Sill during the campaign along with all of its officers: Captain James Montgomery Bell, First Lieutenant John William Wilkinson, and Second Lieutenant William Franklin Clark. H Troop also was stationed at Fort Sill and its officers, Captain Charles Camilus DeRudio, First Lieutenant Hugh Lenox Scott, and Second Lieutenant William Herbert Baldwin, did not participate in the Pine Ridge Campaign. Rounding out the twelve companies of the 7th Cavalry Regiment were L and M Troops. Earlier in 1890 Congress had taken the step of reassigning all soldiers in L and M troops in every cavalry regiment across the line army as a means of increasing the troop strength of the other ten troops of each regiment in order to bring them closer to their authorized inventory. The officers of those troops were detached to other assignments. 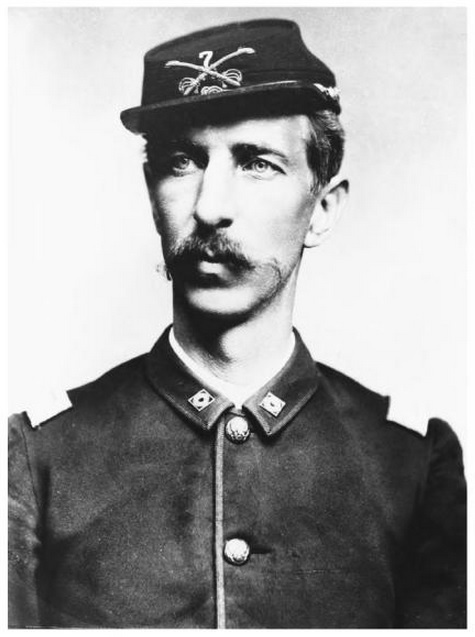 In the 7th Cavalry’s L Troop, those officers included Captain Edward Gustave Mathey who was detached on recruiting service, First Lieutenant Herbert Jermain Slocum who was absent on leave, and Second Lieutenant George Oscar Cress on detached service at Knox College, Illinois. M Troop officers included Captain Frank Marion Gibson and First Lieutenant Albert Judson Russell, who were absent on leave, and Second Lieutenant George Hamilton Cameron on detached service at West Point. Thanks to the artistic talents and diligent attention to detail of Amy Gigliotti of Fullerton, California, Grabill’s photograph, “The Fighting 7th Officers,” can now be seen in full color. In future postings I will provide detailed biographies of each of the officers present at Wounded Knee and link them into this page. As always, I welcome your comments and feedback. National Archives and Records Administration (NARA), “Pine Ridge Agency, S. D., December 1890,” (Washington, D.C.: Returns from U.S. Military Posts, 1800-1916) Microfilm Serial: M617; Microfilm Roll: 1532. Walter M. Camp, comp., “Walter M. Camp Photograph Collection,” Birgham Young University, http://contentdm.lib.byu.edu/cdm/singleitem/collection/Camp/id/270/rec/5 accessed 23 Aug 2013. Walter Camp provided the following identification on the back of John C. H. Grabill’s photopgraph “The Fighting 7th Offciers”: Standing- Lt. L.S. 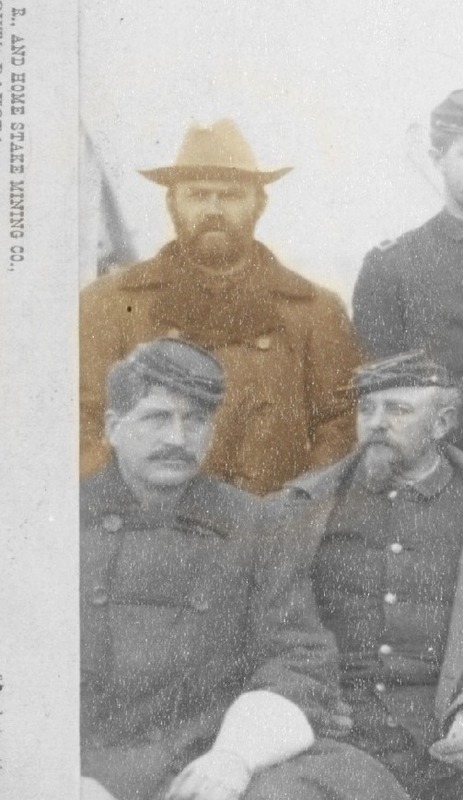 McCormick, Adjutant, 7th Cavalry; Lt. Maxfield, Signal Officer; Lt. W.S. Scott, 1st Cavalry; Lt. William J. Nickolson, 7th Cavalry; Lt. S. Rice, 7th Cavalry; Lt. T.Q. Donaldson, 7th Cavalry; Lt. Franklin Bell, 7th Cavalry; Lt. H.G. Squires, 7th Cavalry; Lt. E.P. Brewer, 7th Cavalry; Lt. E.B. Fuller, 7th Cavalry; Lt. H.G. Sickle, 7th Cavalry; Doctor LeMay, Veterinary Corps; Lt. Selah R.H. Tompkins; Sitting- Captain W.S. Edgerly, 7th Cavalry; Captain C.S. 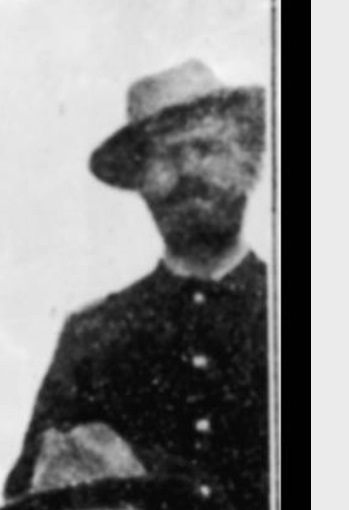 Illsley, 7th Cavalry; Lt. H.H. Wright, 9th Cavalry; Captain Charles A. Varnum, 7th Cavalry; Colonel James W. Forsythe, C. O. 7th Cavalry; Major Samuel M. Whitside, 7th Cavalry; Captain M. Moylan, 7th Cavalry; Captain E.S. 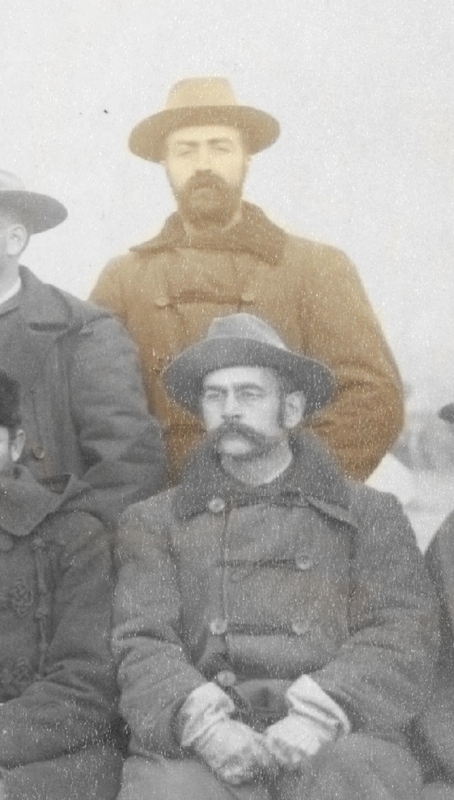 Godfrey, 7th Cavalry; Captain Van Hoff, (Doctor); and Lt. J.C. Gresham, 7th Cavalry. 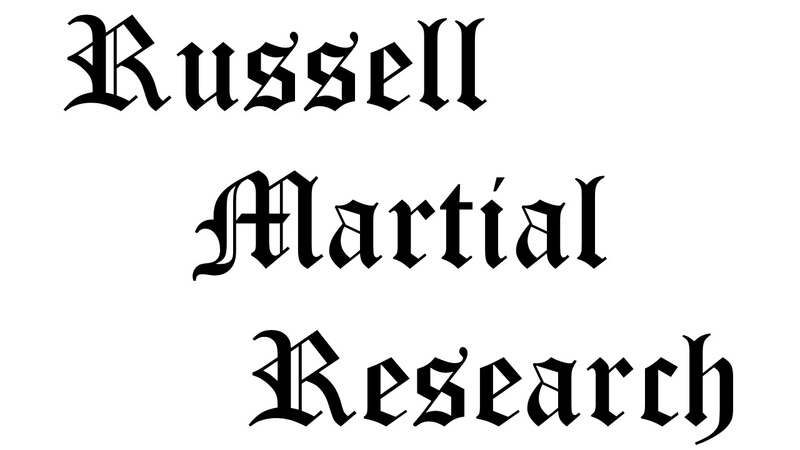 Citation for this article: Samuel L. Russell, “Fighting 7th Officers,” Army at Wounded Knee (Sumter, SC: Russell Martial Research, 2013-2015, http://wp.me/P3NoJy-4L) last updated 12 Dec 2014, accessed date __________. Thank you for your work and for posting this picture. I am sure you will hear from our family historian, Zan Stark, who may be able to give you copies of many original pictures and other material. H.G. Squiers is our great grandfather. Our grandmother, Gladys Squiers Rousseau, was his oldest child. On going a little way farther, we passed an old outhouse and we heard a noise inside, somewhat like a cat, and we looked in and saw a little papoose. She was a beautiful child and clothed in a fine buckskin suit. Second Lieutenant Herbert G. Squires went in and got it and it began to laugh so he said it’s name would be Laughing Swan, and that he was going to take it home to his wife, which he did. The quote is from Andrew M. Flynn who related the story in 1939 in Winners of the West. He had served as a young medic in A Troop, 7th Cavalry. Flynn had misidentified another officer in this same account and may have also mistaken some other officer for Squiers; he was reflecting on the battle half a century later. I realize of course that Lieut. Squires was not at the battle of Wounded Knee, having returned to Fort Riley to attend a board of promotion. He did, however, rejoin the campaign at Pine Ridge in January 1891. Is there any truth to Flynn’s statement that Squiers adopted a Lakota baby? 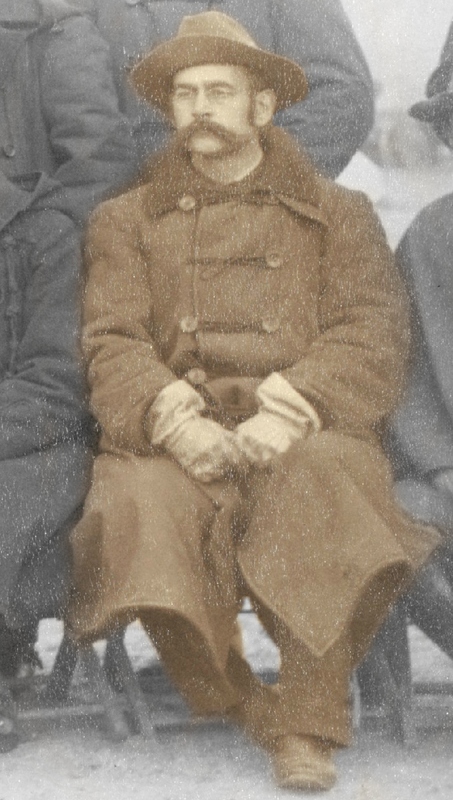 Dear John: I was just doing a search on my great grandfather, Herbert G. Squiers AND was very surprised to see your post. Yes, I have a copy of my 1997 undergraduate thesis at Rosemont College in Rosemont, PA. Note: my thesis is an overview of his life. HGS has always been, “My Secret Hero”. I have many letters and pictures of Squiers and his family. Some are here with me in Asheville, NC How did you become interested in HGS? His father-in-law was ADM Harry Harwood Rousseau was an important figure (under Gen Goethals) in building the Panama Canal. Look forward to hearing from you. Great website. I noticed a Captain John Van Rennselaer Hoff. The Van Rennselaers’ are how my family, the Blauvelts came over working for Van Rennselaer in Albany onboard the Kalmer Nyckle in 1638. I did my captsone at Norwich on Wounded Knee. I started working on a new paper on Wounded Knee hopfully to published soon and was lookign for new information when I found your site. I see the muster rolls for some of the companies. But do you happend to have or know where to get K troops muster roll? All of the Army’s muster rolls are in the National Archives in Washington DC. I do have photos of each of the companies that were at Wounded Knee, but a few too grainy to make out. I’ll eventually have to return to the archives to redo my records. I am slowly moving through each of the units and am up to D Troop. K Troop will be my last line company from the 7th Cav, followed by A Battery, 1st Art. Unfortunately, the archivist have not been able to locate the muster rolls for the Indian Scouts that were present. I may pay a professional researcher to see if they can dig them up. If you go to NARA, you have to obtain special authorization to view the muster rolls. The 7th Cav’s for that period have been handle so many times that an archivist has laminated them to keep them from falling apart, as some already have. One of the troops, I don’t recall which, was taken apart and reassembled in the wrong order. Not sure if I’ll be able to reconstruct it once I come to whichever troop it was. Thank you for the information Sir. Since it is unlikly I will be able to get to the NARA anytime soon, I await your updates. Is there a particular soldier that you’re looking for, or the entire company muster roll? Mr Russell, you note above that you have photos of each of the companies at Wounded Knee. My Great Grandfather was John Charles Waterman who was then a thirty-three-year-old Second Lieutenant of Captain Nowlan’s I Troop, 7th Cavalry, who had been with the regiment since graduating from West Point in 1881, as you note. Do you have a photo of his company or any other information on him? My grandfather graduated from Annapolis and my father graduated from West Point. I spent 30 years in the Air Force. Thank you for your dedicated research and time. Col. Scott… Thank you for taking the time to comment. When I mentioned that I have photographs of all the companies, I was referring to all of the muster rolls. I have posted those of troops A, B, C, D, E, G, and H. I will eventually get to companies I and K, battery E and the troop A US Oglala scouts. I do not necessarily have photographs of the men in the companies. Once I get to Troop I, J. C. Waterman’s unit, I will post about him. I am working on another project from the French and Indian War that has diverted my attention from Wounded Knee for most of the past year. I hope to get back to the 7th Cavalry soon. My apologies Sir. I note that you are a retired Colonel, as I am. I should have addressed you as Colonel Russell. Sam I am looking for private William F. McClintock I’m thier roles. Been involved with piecing together a story of this ohio soldier since 1974. Any chance of finding a picture? Mr. Joeright… Thank you for your comment. Unfortunately, as with most of the 7th Cavalry enlisted troopers, I have very little information on William F. McClintock. I have two news articles announcing his death, some photographs of his gravesite, and the Final Statement from the Army regarding his death and inventory of personal effects. I’d be interested in any information you care to share. Mr. Russell, my interest is personnel. My mothers, father, my grandfather was at Wounded Knee. He was a furrier. The only thing I was ever told about him was that he took care of the horse Comanche from the Little Big Horn. He was at the horses at its death with his hand on his pulse at the time of death. He left a lovely letter to posterity of the facts. I had asked for his papers from D.C. as I am also an Army Veteran. That is when I found out about his attendance of this action. I have no information on if he participated in the action or not. I have the statement of his officer who states he was there. At this time I do not remember his name. When I find it again I will try to give you the info and a copy of the statement if you wish. I thank you for all of you wonderful research. I am enjoying reading about the officers and seeing the pictures. If you would like I will try to get to you a picture of Grandpop in uniform and a picture of him with Comanche that is at the museum in Kansas. Thank you again. Nancy Lee Harsh US Army veteran SGT 1975-1981. Remarks: On detached service at Ft. Riley, Kans., since Nov. 24, ’90, in charge of troop property. To What Time: Oct. 31, ’90. Col. Russell – I’m wondering if you can shed some light on how my relative, George Allan Dodd, managed to not be involved at Wounded Knee. I thought he was with the 7th about this time? Ms. Selfridge… The Army had ten regiments of cavalry in 1890, numbered 1st through 10th. During the Pine Ridge Campaign, elements of 1st, 2nd, 5th, 6th, 7th, 8th, and 9th Cavalry Regiments were deployed to the Dakotas. However, no troops from the 3rd Cavalry Regiment participated in the campaign. In December 1890, George A. Dodd was serving as the captain of F Troop, 3rd Cavalry, which was stationed at Fort Davis, Texas. According to the Fort Davis post return for that month, Capt. Dodd was absent on leave initially for two months and later extended for another two months. I haven’t been able to respond to your message above until, sorry for the delay. I and looking for a trooper with the last name of Davis in Wallace’s company. Private Davis, William J., enlisted 27 June 88 at Anapolis, Md., by Capt. Col. Russell, thank you so much for posting this blog. 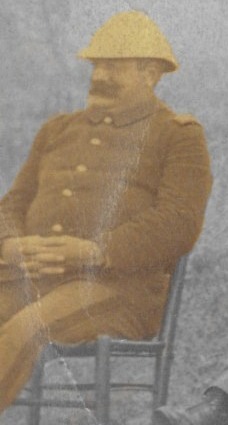 My gggrandfather, James M. Wallace, was a first cousin to Capt. George D. Wallace, their fathers being brothers, so I am very interested in your posts. I also have relatives living in Pine Ridge today so that’s a double interest. I have been to Wounded Knee and have photos of George Wallace’s tombstone. I will enjoy reading all your blogs on this very interesting topic. P.S. I was able to get all of G. Wallace’s records from West Point. Brenda… Thank you for your post. I have a copy of Mackintosh’s Custer’s Southern Officer, Captain George D. Wallace, 7th U.S. Cavalry and am interested in any information you have on Captain Wallace that you are willing to share, particularly any photographs, letters, or records you may have. As I am now stationed in South Carolina, I made it up to York to see Captain Wallace’s grave on Memorial Day this past summer. Thank your for your comment and interest. I did a quick check on your ancestor’s name and was able to confirm him on the November 1892 Muster Roll for Fort Sheridan, Illinois, which shows: Wood, Augustine W., Principal Musician, 17th Infantry Regiment band awaiting retirement. His original enlistment record shows that he was born in Boston, Mass., about 1848, enlisted in Richmond, Va., in Sep 1869, had been a musician by trade before enlisting, had black eyes, dark hair, a light complexion, and stood just over five feet, five inches tall. He was assigned to the Band, Field and Staff of the 17th Infantry Regiment. His pension application indicates that during his career, Augustine W. Wood served in the Band and B Company of the 17th Infantry Regiment and also served in the 11th Infantry Regiment. Based on the information you provided and those few records, it sounds like he never served in the 7th Cavalry Regiment. The 17th Infantry was assigned to the Department of the Platte in 1890 during the Pine Ridge campaign that winter but none of that regiment were at Wounded Knee. That regiment was normally garrisoned at Fort D. A. Russell, Wyoming. They moved closer to the scene of the outbreak in December 1890 by locating at Cheyenne River under the command of Lt. Col. Robert H. Offley. (Greene, American Carnage, 137) I cannot tell you if the 17th Regiment brought their band to the field; most of the regiments did not. The exception was the 1st Infantry Regiment who brought their band from Angel Island, Calif. So, the bottom line is that your ancestors regiment was part of the Pine Ridge Campaign of November 1890 – January 1891 but did not take part in any of the engagements of the campaign and was not at Wounded Knee. The 17th Infantry Regiment’s campaign credits include the Little Bighorn Campaign 1876-1877 (which included, but should not be confused with, the battle of the same name), the Pine Ridge Campaign 1890-1891, and North Dakota 1872. I am a retired history professor, and recently began volunteering at Fort Bayard National Historic Landmark in New Mexico…..I am beginning research on Henry Haviland Wright, officer in the 9th Cavalry, who was prominent in the Apache campaigns in NM, and was part of K Company in the aftermath of Wounded Knee. Do you think he might have been asked to pose with the 7th Cavalry in tribute to the role of the 9th in coming to the aid of the 7th in the fighting after the major incident at WK? In the days following the fight at Drexel Mission, the press had praised the 100-mile ride Henry’s battalion made in answer to Forsyth’s request for assistance. However, the news media embellished the battle, indicating that the 7th Cavalry was on the verge of being annihilated at the hands of the Sioux, just as they had been fourteen years earlier at the Little Big Horn. The Chicago Inter-Ocean wrote a fantastical piece that was widely circulated through many papers. A week after the fight, Henry wrote to Forsyth in response to the fanciful media coverage. My grandfather, John Murray, was a Private with D Troop and was at Pine Ridge. He died in 1958, at age 93, when I was 12 years old. He told us stories of the Indians, including Two Strikes and an Indian named Red Stick. I have his discharge document signed by Col. Forsyth and a Lt. Slocum. His CO was Captain Godfrey, when he was with D Troop. He had originally been with M Troop, commanded in 1888 by a Capt. Gibson. I found a note on a letter to the VA in the 1930s saying that M Troop was “skeletonized” and he was reassigned to D Troop. I am trying to find if he was actually in the Wounded Knee encounter or was back at Pine Ridge. He did tell us that he was at Drexel Mission. Appreciate any info you have. While I cannot say with certainty that he was present at Wounded Knee, I can say that he was reported as present for duty on 31 Dec. 1890, the date of the muster roll. The note from the VA is correct in that both L and M troops of every cavalry regiment in the summer of 1890 were skeletonized, that is, the officers of those units remained assigned to those troops, but the soldiers were all assigned to the other 10 troops. It was a method of bringing most of the troops up closer to their authorized strength. Your grandfather lived a very long life, and his death in 1958 would have meant he was one of the last surviving soldiers from Wounded Knee. There was a private from K Troop, Hugh McGuinness, who died in 1965 and was the last surviving soldier. Did your father leave any written letters, diaries, or reminiscences of the campaign or the battle? No, we have no letters, etc. of my Grandfather’s time in service, except his original discharge document. As a child, I remember seeing an old uniform in the cellar, when I would help him shovel coal into the furnace. I do remember him telling us about Bill Cody. He also told us of firing at the Indians and he mentioned Red Stick, who, if memory serves, was the son of a Chief. I’m attempting to trace his movements from entry till discharge. I assume I have to go to Washington, to the archives, to find what I can. Any suggestions would be welcome. By the way, thanks for your service, from one vet to another. Thank you for your service to our Nation and best of luck with your research. Sam, I continue to be so thankful that you got in touch….and for all the hard work you’ve done to document all this. Knowing more about our family’s history on the Whitside/Miller side is such a precious gift! My father-in-law has a fire arm that has initials CWE, which I believe were for Charles Wm Ewing, and it has something to do with the 7th calvary. But the Charles Ewing you have listed has the middle name of Beverly, is this correct or can the Charles W. Ewing also have something to do with that regiment? Please let me know as he would like to find out. JoAnn… I went back and checked my records on Charles Ewing. His middle name definitely was Beverley or Beverly. I have all of the rosters and there is no other Ewing. Of course, Ewing wasn’t in the 7th Cavalry. He was an Assistant Surgeon for the Department of the Platte.